William Friedkin’s long-awaited Killer Joe, adapted by the Pulitzer-Prize winning playwright, Tracy Letts from his play of the same name, is this year’s Festival’s Opening Gala film. And while this darkly comic thriller has been the most anticipated film at the festival, they hype is to be believed, as Friedkin, Letts and Matthew McConaughey have committed one of the most inspired and memorable pieces of film committed to celluloid. 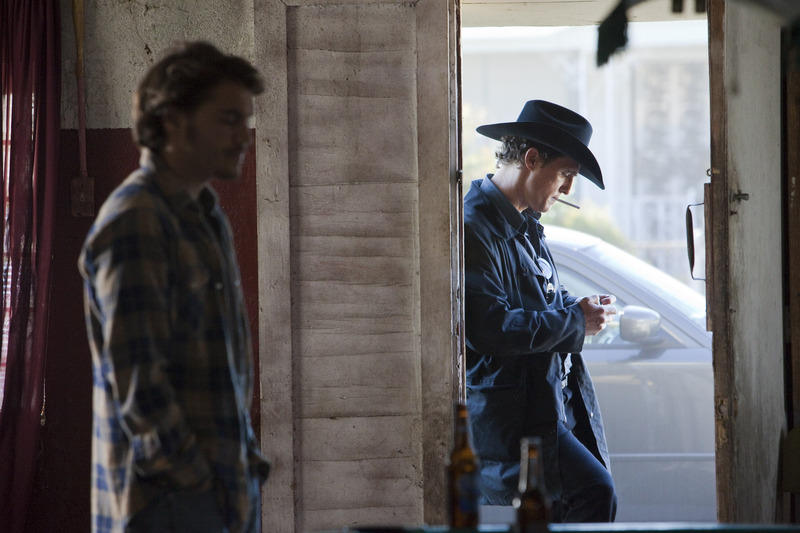 When Chris (Emile Hersch) needs $6,000 to pay off a debt, he and his family (Gina Gershon and Thomas Haden Church) decides to hire ‘Killer Joe’ (McConaughey) to kill his estranged mother in order to get at her $50,000 life insurance policy, which will be paid out to his younger and very innocent teenage sister, Dottie (Juno Temple). But the lack of a cash deposit for Joe’s services means that he has to take a retainer, in this case, Dottie, before he carries out the murder, which takes Chris and his family into a deadly game of betrayal, violence and degradation. A strong mix of black comedy, thrills and explosions of violence, Killer Joe is a defiant and unapologetic film that explores and questions just what we would do for money by presenting this question in an extreme situation. While the film does leave certain questions unanswered and maintains a certain air of ambiguity throughout, the strength of Friedkin’s piece lies in its ability to not only get under the skin, but also to sink its teeth into your skull. Completely mesmerising and ultimately unforgettable, Killer Joe is an utterly unique and powerful film, that shows how vulnerable we all truly are, and how easily situations can spiral out of control. McConaughey’s turn as the cold, calculating, yet complicated hired killer, is both terrifying and inspiring; his performance is flawless, natural, and completely believable. Perhaps one of the darkest, yet most impressive films on the festival programme this year, Friedkin and Letts have created a simple yet catastrophically effective new piece of cinema that could become a masterpiece.